The Road to Calvary, an epic novel by Alexey Tolstoy, deals with the time period from 1914 to 1920, six years that changed the course of the history of Russia and of the whole world forever. 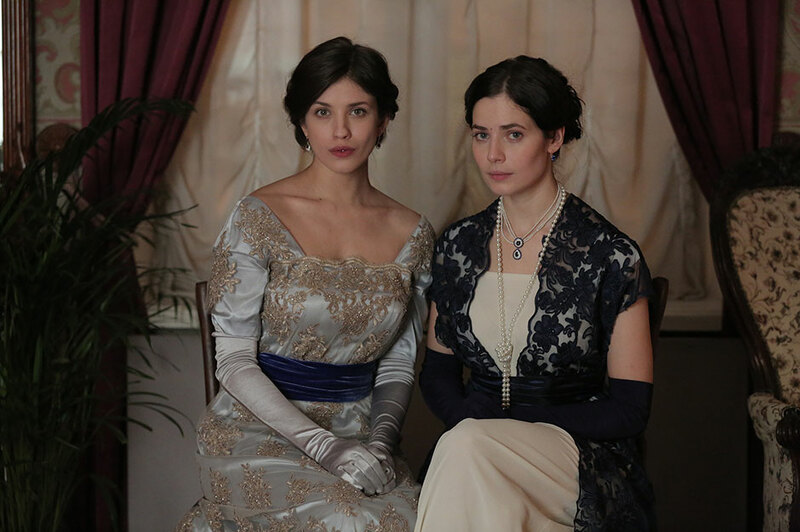 The landmark book has become the basis for NTV channel’s series directed by Konstantin Khudyakov, with the script written by Elena Raiskaya. 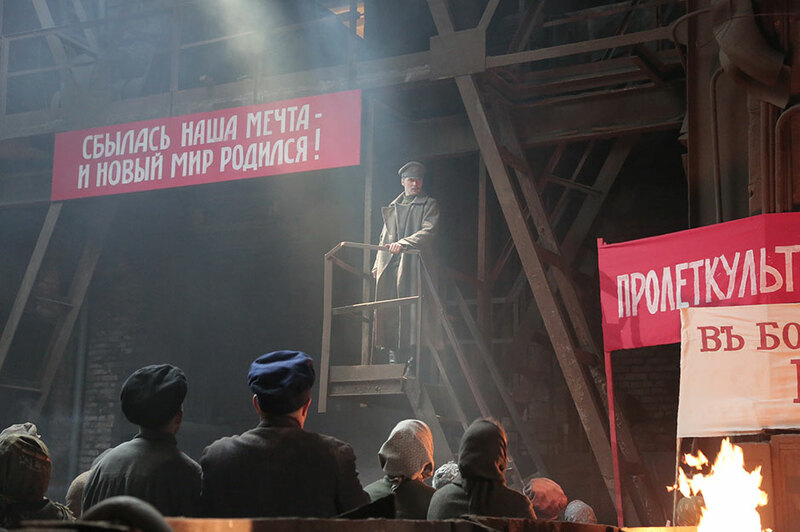 The TV series will be broadcast on the 100-year anniversary of the Russian Revolution of 1917. St. Petersburg, 1914. The decline of the Silver Age. The capital city lives as if in anxious expectation of some fatal, fearful day”. Russia strives for changes. The central characters in the story are the Bulavin sisters. 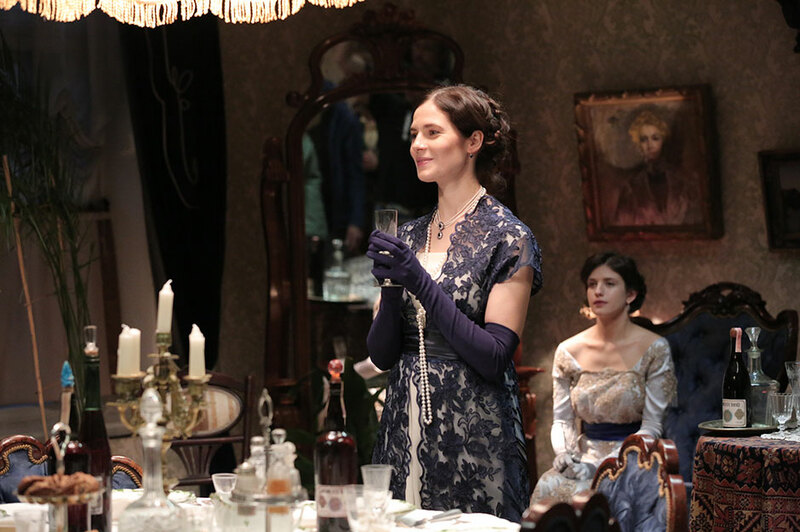 The young Dasha (by Anna Chipovskaya) is stern and idealistic, while the married Katya (by Yulia Snigir) is careless and unhappy in her marriage. Both girls fall in love with a Decadent poet Alexey Bessonov, the master of minds, who is hopelessly disappointed in life. 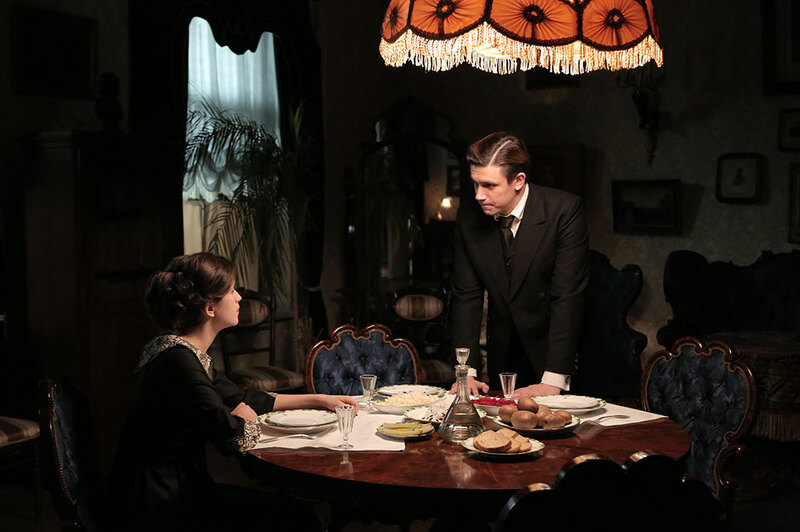 The love drama turns into a tragedy as World War I begins. The whole country is bestirred, a flow of fateful events carries the sisters away, separates them, destroys their families and puts them on the different sides of the barricades. 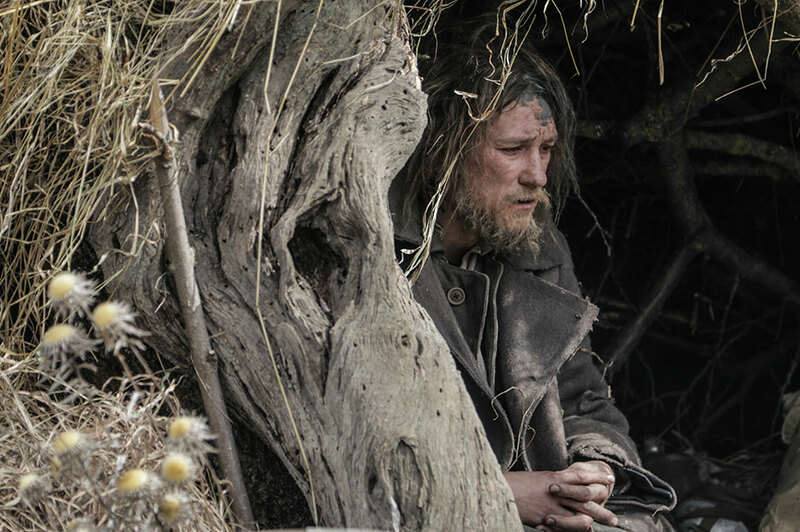 The characters’ paths often cross and diverge again. But out there, at the end of this continuous walk of pain, the light of hope and of a new and never-before-seen world is shining. Our characters exist in an extreme situation of never-ending choice all the time. This echoes our present-day life. The quiet existence in the Soviet state is over and now people have to make decisions, they must take actions. The terrible revolutionary time forced people to change the stereotypic ways of living for the new, fresh, unexpected and sometimes risky ones”. At the awkward age of nineteen, life is bound to be hard, especially if one is a girl, and far from stupid, and if an idiotic puritanism makes one unnecessarily hard on those — and there were plenty! — who would have been only too glad to dispel one’s virginal tedium”. Katya betrayed her husband, but having betrayed, having sinned, having lied, she became even more charming. Only the blind man would not notice something new, some specific languorous tenderness in her. And the way she lies can make one go crazy — and fall in love with her”. Answer me: what is one’s country? What is it for you? 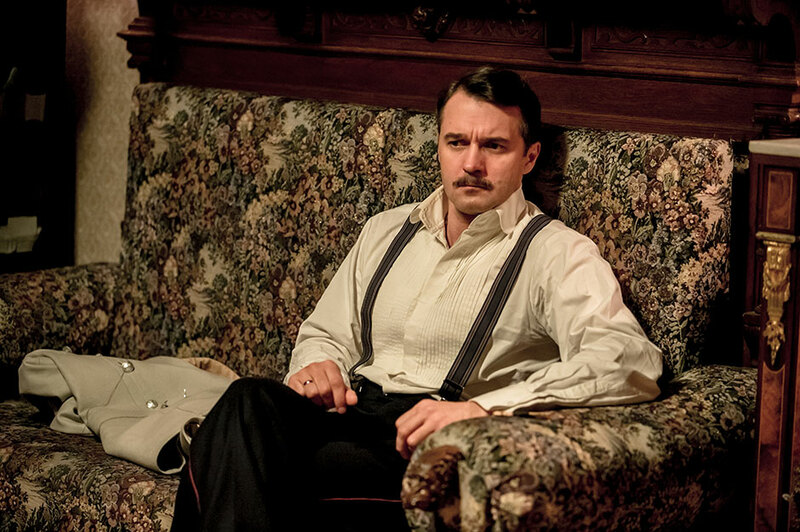 You are silent… I know what you would say… People only ask that once in a lifetime, when they have lost their country… Oh, it’s not my Petersburg flat, my legal career that I lost… I’ve lost the great man in myself, and I don’t want to be a small one”. Morally, we’re all in a blind alley, Katya. I haven’t had a single powerful emotion for the last five years, or taken a single important step. Even my love for you, our marriage, seem to have been just part of the general hurly-burly. Its been mere trivial existence, semihysterical, drugged. There are two ways out — to put an end to my life, or to tear off the film wrapped round my thoughts, my feelings, my consciousness”. [He] remarked abruptly that there was no such thing as art, that it was all a fake, the old trick of the fakir who makes a monkey climb a rope and disappear into thin air. Theres no such thing as poetry. Everything has been extinct for ages — people, art, everything. Russia is mere offal, with a flock of crows hovering over it at a crow’s banquet. And all who write poetry will find themselves in hell one day”. «When a newcomer came to the house she would invite him to her room, where a bewildering conversation would ensue, ranging from dizzy heights to profound depths, as Elizaveta Kievna endeavoured to find out whether her interlocutor had ever felt stirrings towards crime. Was he capable of murder, now? Had he ever experienced an impulse of self-provocation”? This last was a quality which Elizaveta Kievna regarded as the hallmark of originality». The Slav represents a type which is morally quite new, and in some respects a danger to European civilization — the God-seekers. And God-seeking’ (…) spells the negation and destruction of modern civilization. I seek for God, that is, Truth, within myself. For that I need to be perfectly free, to destroy the moral foundations beneath which I am buried, the State which holds me in thrall”. When I was doing hard labour under the tsar, I was picked up by my head, and my heels, and flung on to a stone floor… That’s how the leaders of the people are forged”. 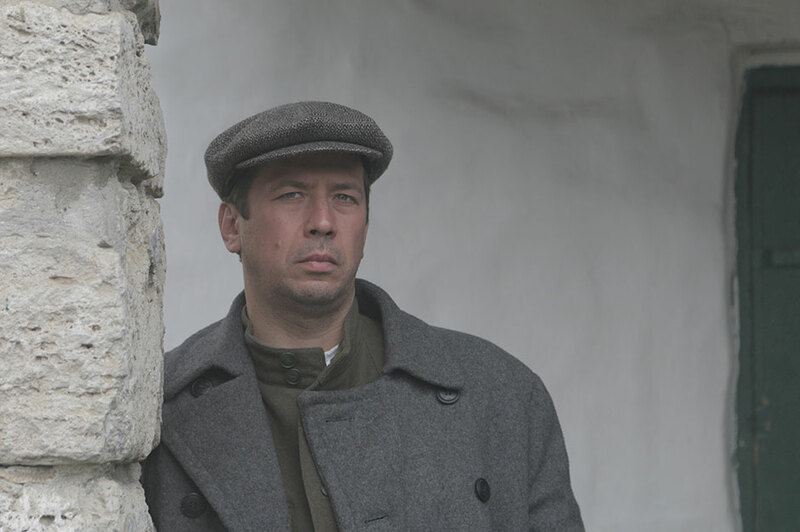 Film director Konstantin Khudyakov can explain any task to an actor and help him to settle into the role. It was said on the set that he works like a sorcerer — whispers and whispers to an actor and finds special words for anyone. 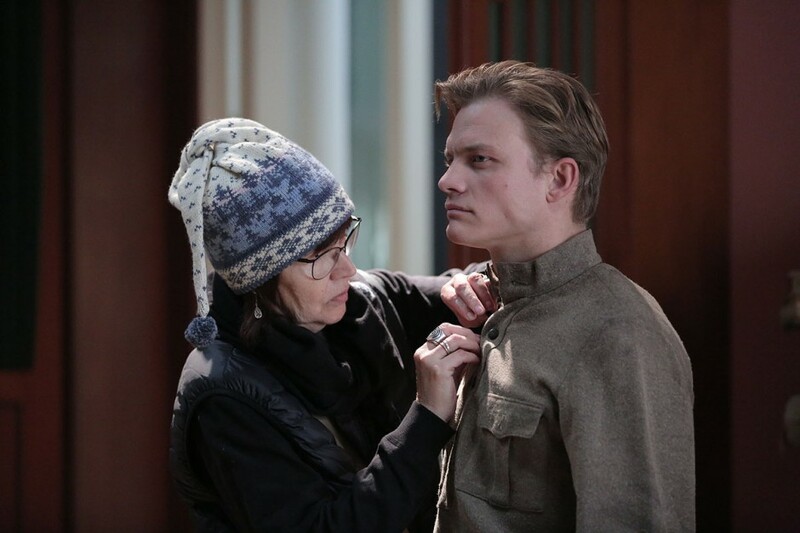 Assistant costume designers were always present on the film set: after every scene they had to check that shirts don’t get wrinkled and the collars stay buttoned. 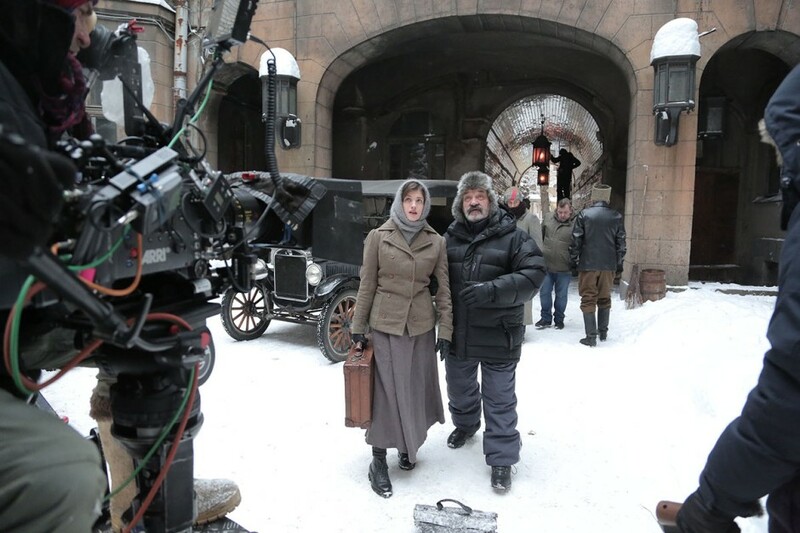 In the photo: actor Alexander Yatsenko and assistant costume designer Galina. 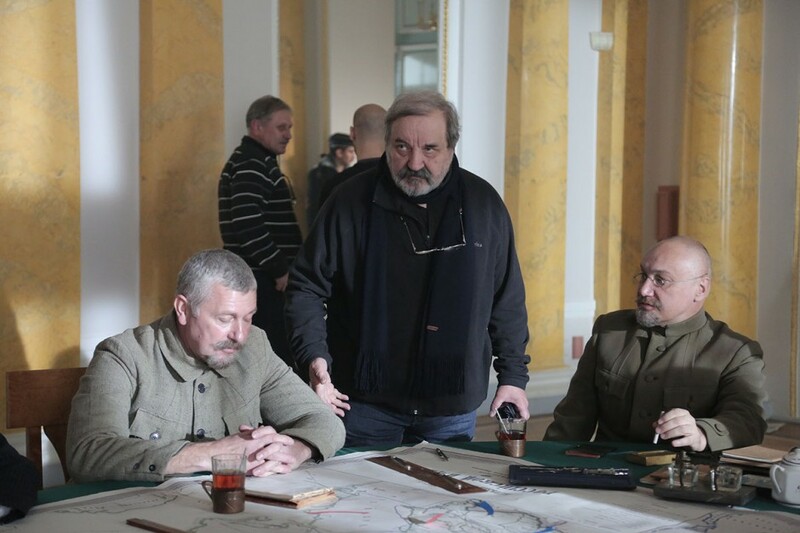 Film director Konstantin Khudyakov, actors Leonid Bichevin and Evgeniy Tkachuk rehearse the episode of Telegin’s enlistment in the Red Army. 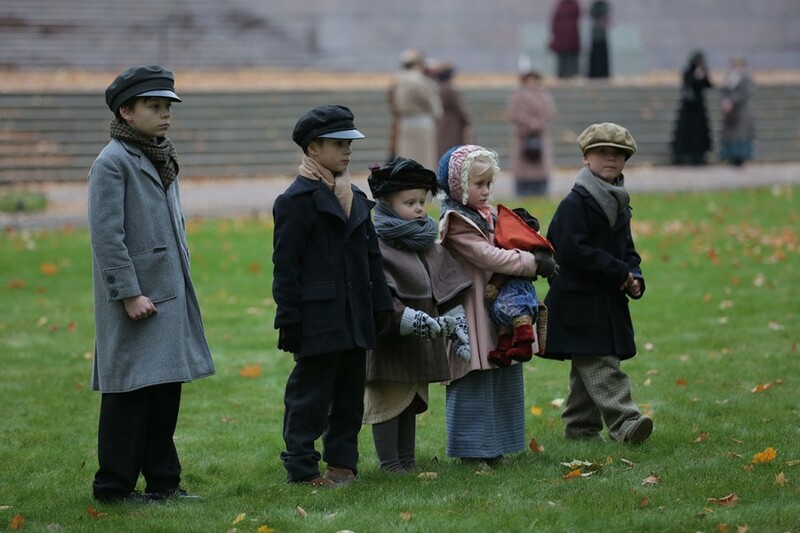 The actors frequently had to endure being wet and cold while shooting. 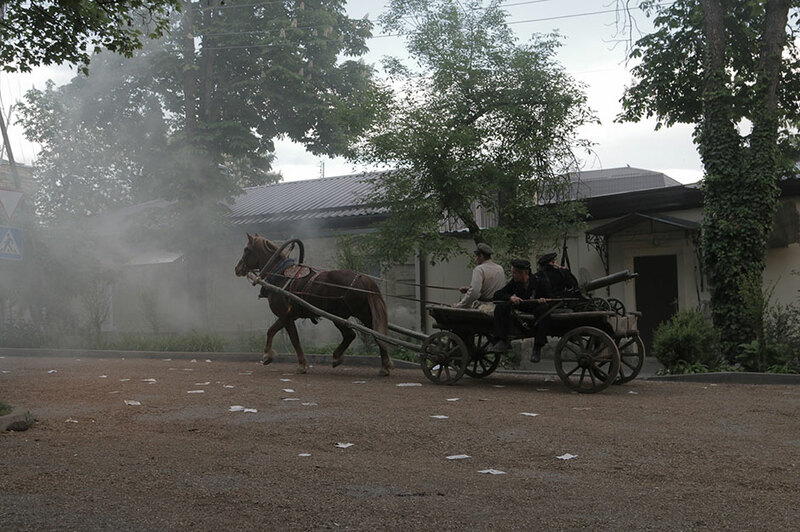 After the episode of jewelry store’s robbery, where the characters need to escape the chase, actor Andrey Merzlikin had to pour water out of his boots. 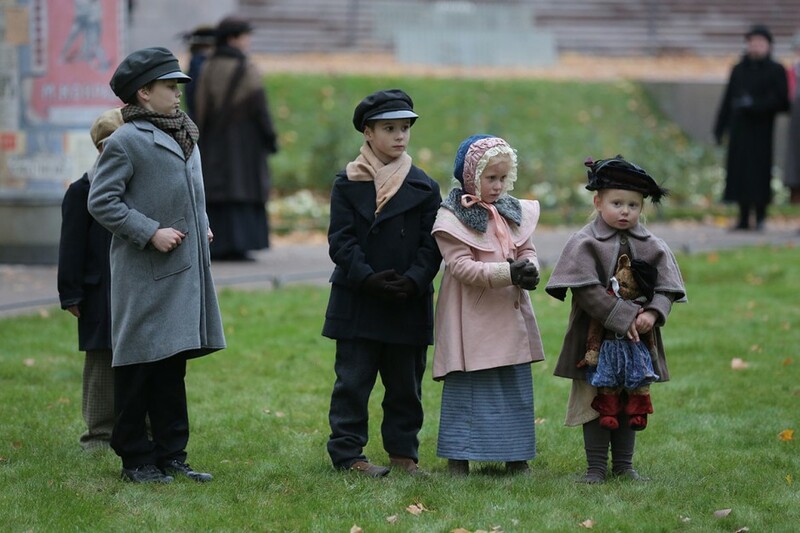 The episode with the children was filmed in the garden of the Russian Museum in Saint Petersburg. 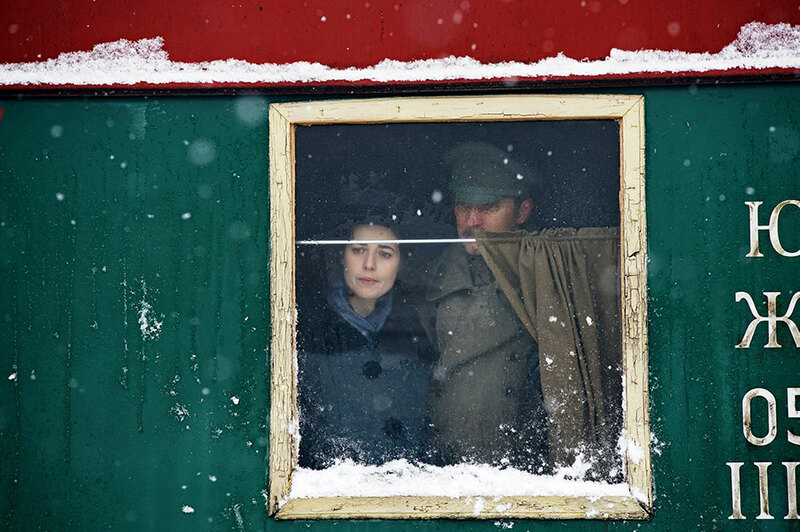 Film director Konstantin Khudyakov and actress Anna Chipovskaya discuss the episode of Dasha Bulavina’s homecoming. Through the window the heroine can see her sister for the first time after having been separated for a long time. 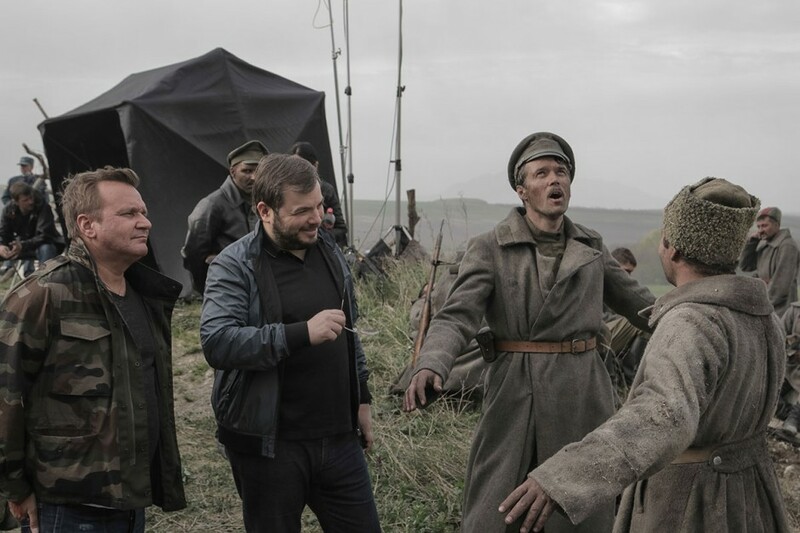 Film director Konstantin Khudyakov rehearses an episode with Alexander Yatsenko. 19 The golden rule of everyone engaged in the shooting of battles between the Red and the White forces was to never wear white clothes and always put on a gauze mask. 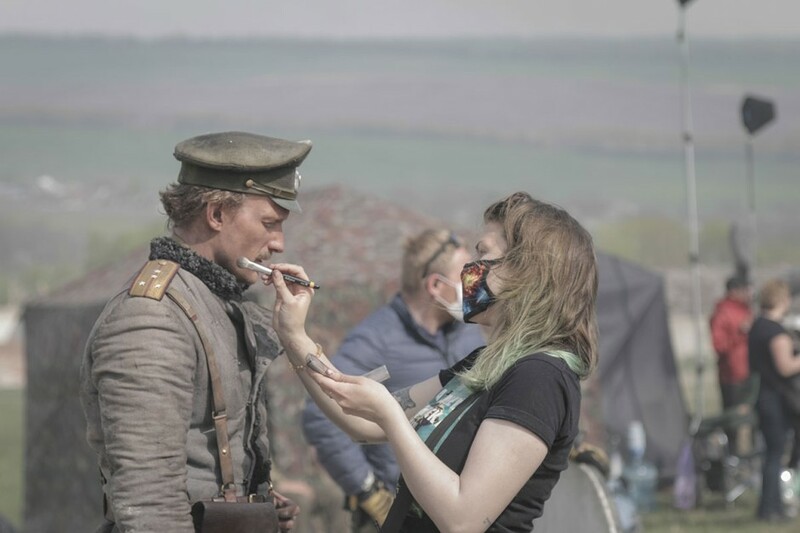 When battles were being shot at least five makeup artists worked on the set – after every scene they were the ones to cover actors with more scars, blood and bruises. 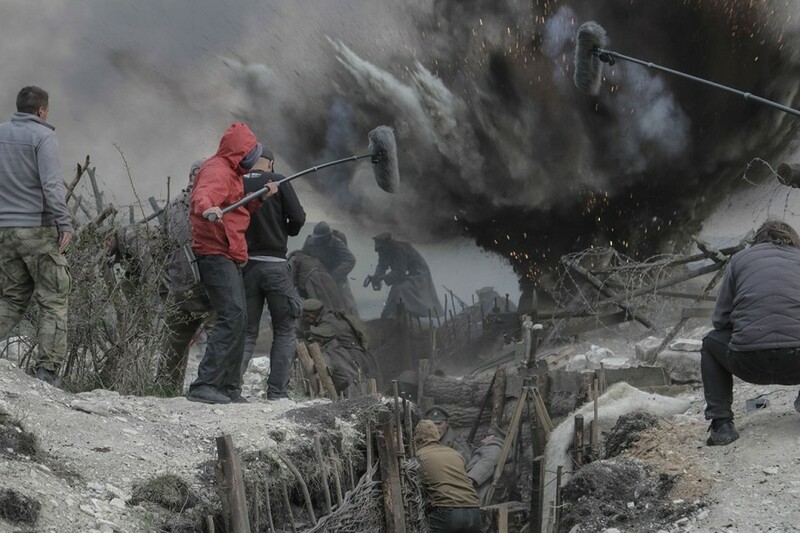 But all the dirt and soot on the faces was real, caused by pyrotechnic visual effects. 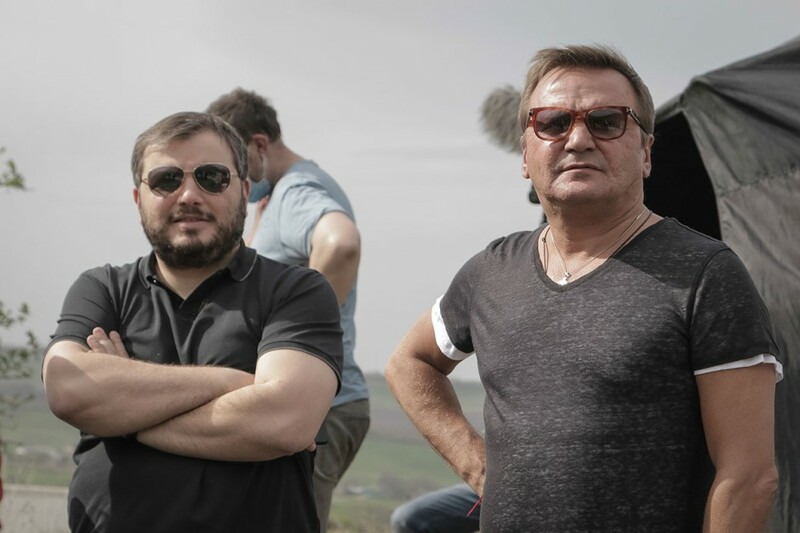 Actor Leonid Bichevin, members of the sound crew, cameraman Maxim Shinkarenko. 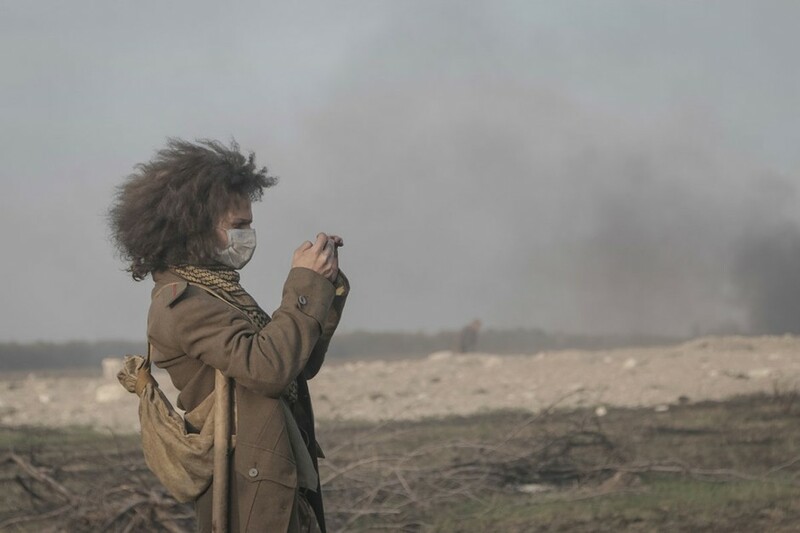 Filming the battle. Battle between the Red and the White Armies. There used to be up to 500 people in shot, among them not less than 30-50 stuntmen, when such episodes were being filmed. 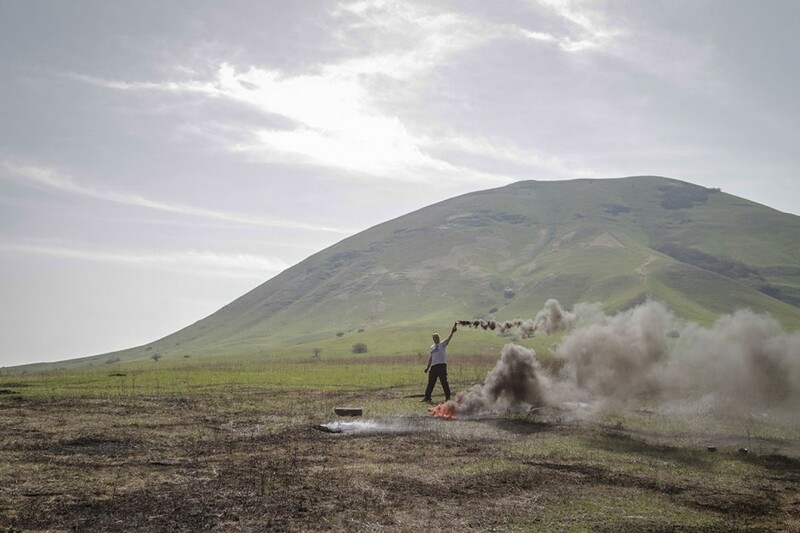 To create the effect of multilayered smoke while filming the battles between the Red Army and the Volunteer Army the pyrotechnicians had burned more than 1000 car tires. 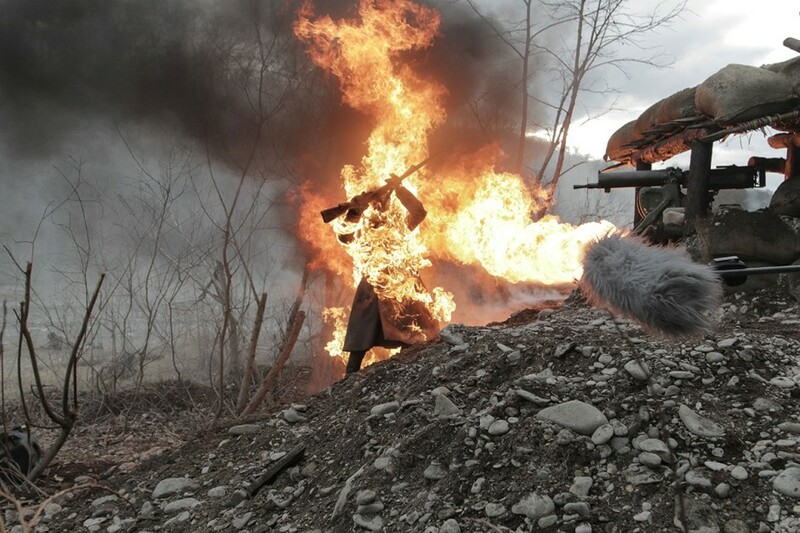 In the photo: pyrotechnician Alexey Ponikarovsky with a smoke flare. 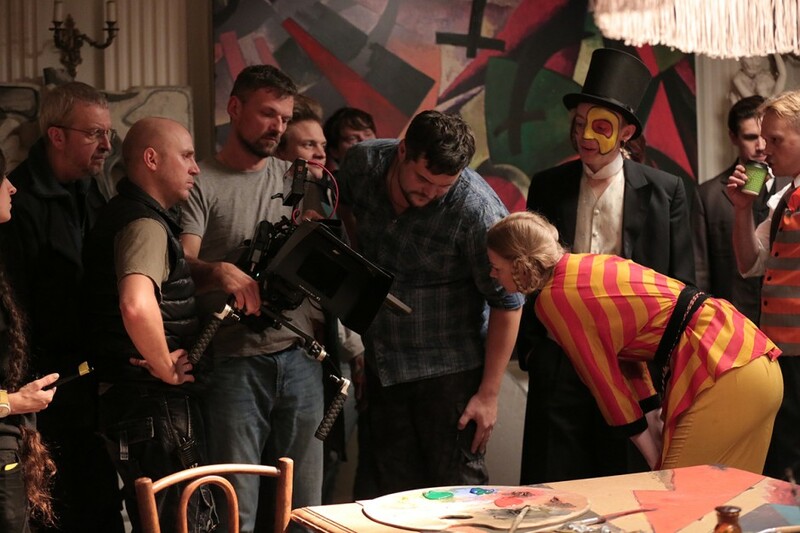 Not only actors were inspired with the atmosphere of the early 20th century, but also the whole film crew. 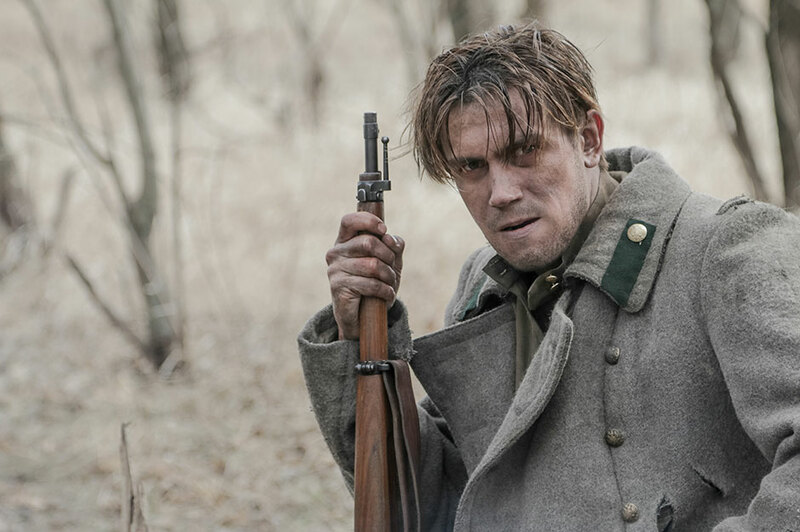 Film production assistant Lev Filenko had even ordered a replica of the uniform of the Civil War times via the online store of retro clothing. 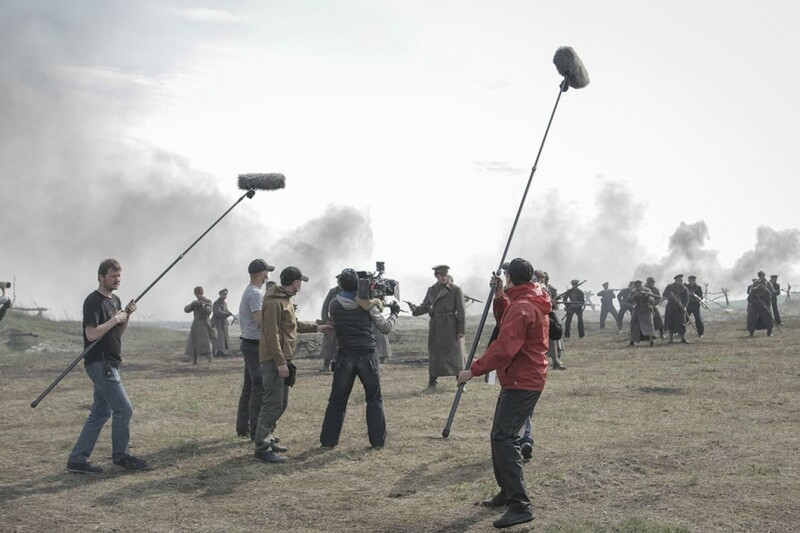 NTV's general producer Timur Weinstein visited the set and got into the middle of the most difficult moment of shooting, when the battles between the Red Army and the Volunteer Army were filmed. Explosions, smoke – it was hard to breathe, everybody who could took shelter or wore gauze masks. Needless to say with the exception of the actors in shot. 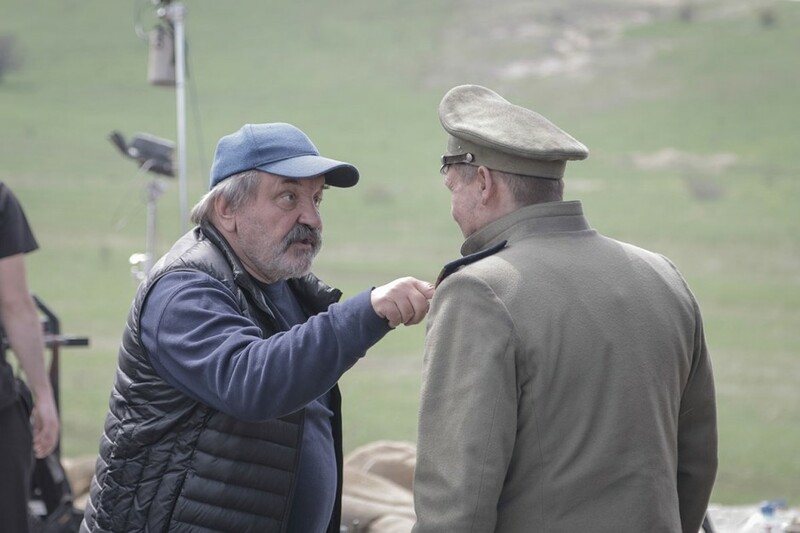 In the photo actor Pavel Trubiner and Timur Weinstein. 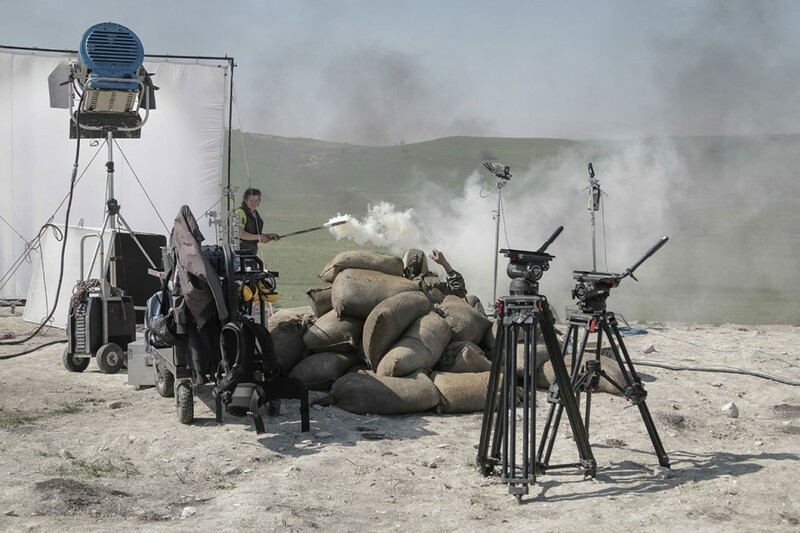 NTV's general producer Timur Weinstein during filming the battles in vicinity of Pyatigorsk. 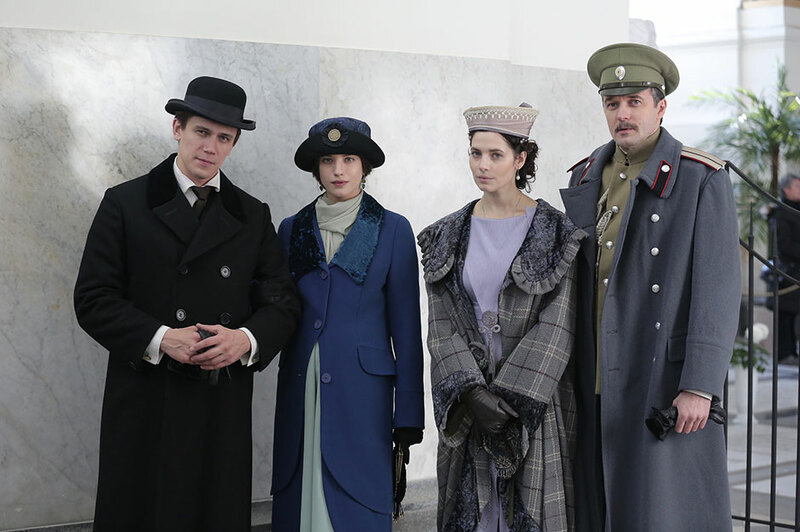 One of the longest episodes filmed in Saint Petersburg – session of the Red Government in Smolny. 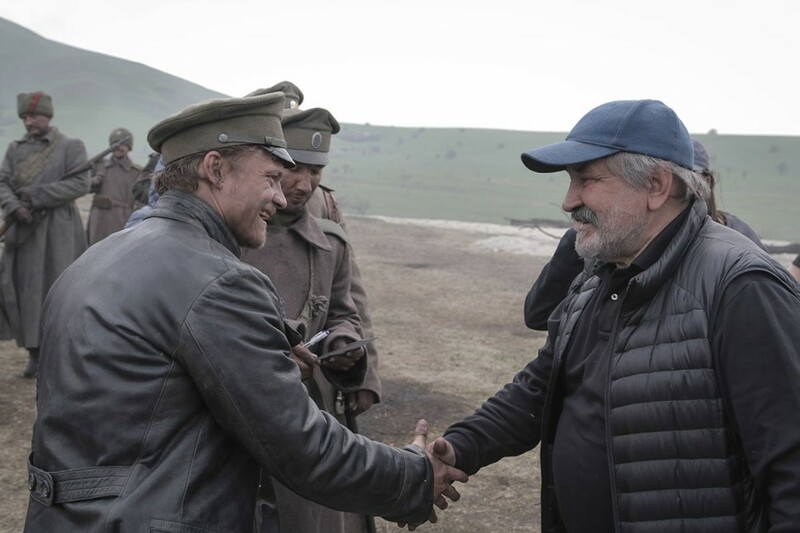 In the photo: film director Konstantin Khudyakov and background actors. 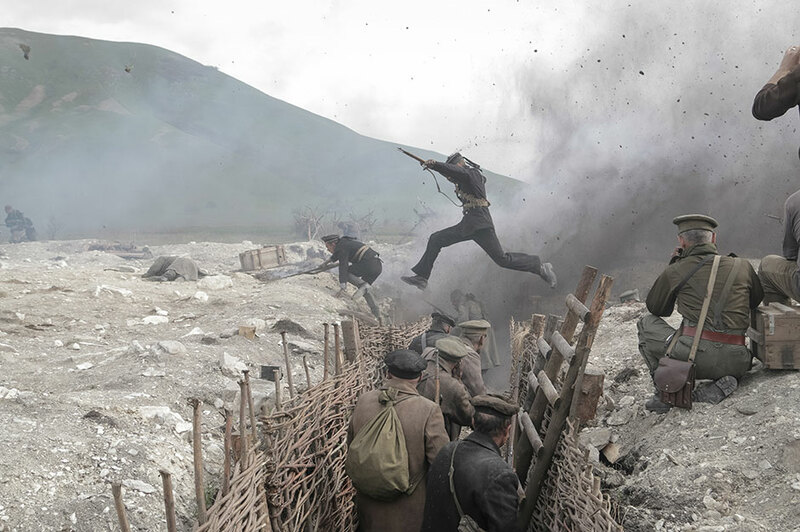 While filming battle scenes the pyrotechnic crew used nitrate, cement and other substances. 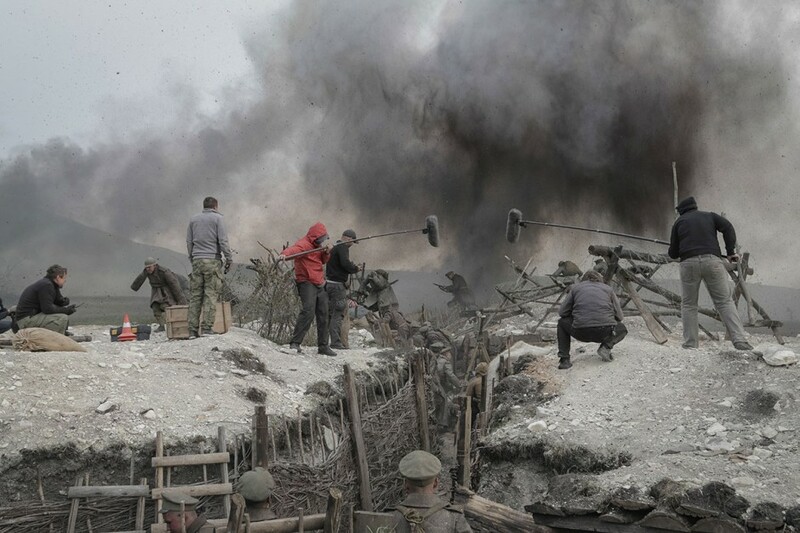 Only stuntmen are allowed to stay in the proximity of explosions, other members of the filming crew must keep safe distance. 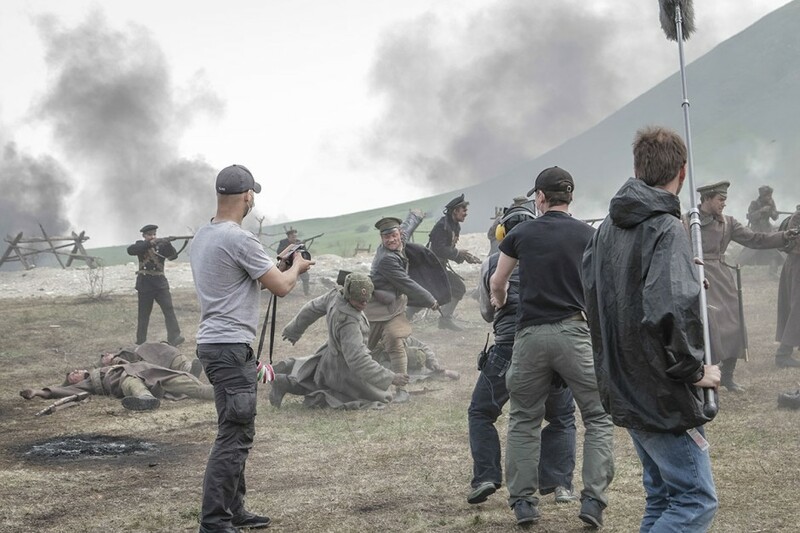 To maintain the authenticity of the historical battle the crew had to fully recreate the conditions of the Civil War – to dig trenches, make bags and buy 300 meters of fences to secure them in place. In the photo: actor Vladimir Yumatov and the makeup artist. Left – 2017, right – 1917. 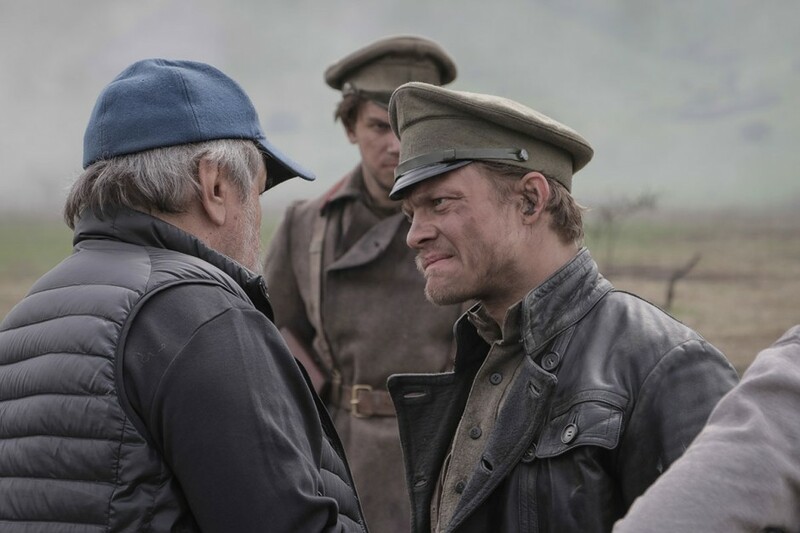 Left – film producer Yuri Sapronov and NTV's general producer Timur Weinstein, right – actor Pavel Trubiner in the role of the Civil War soldier. 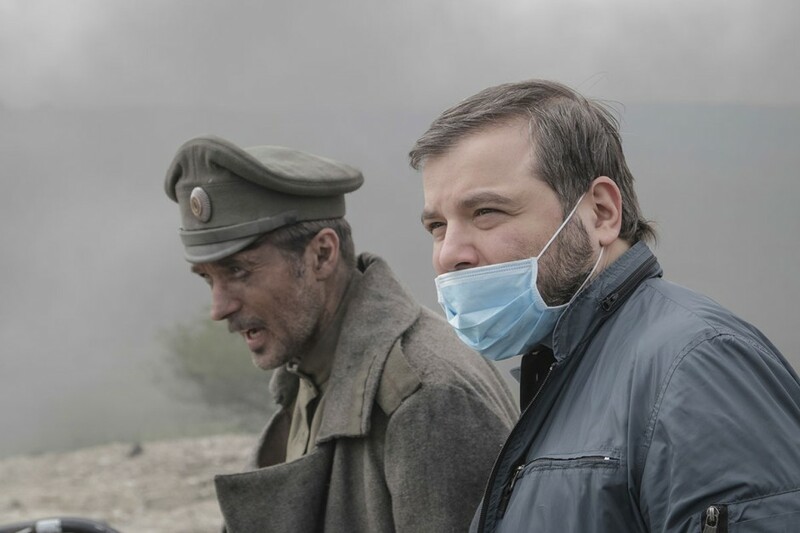 NTV's general producer Timur Weinstein and film producer Yuri Sapronov have produced together around 200 movies and series, but have never yet been in the middle of such a large-scale battle. 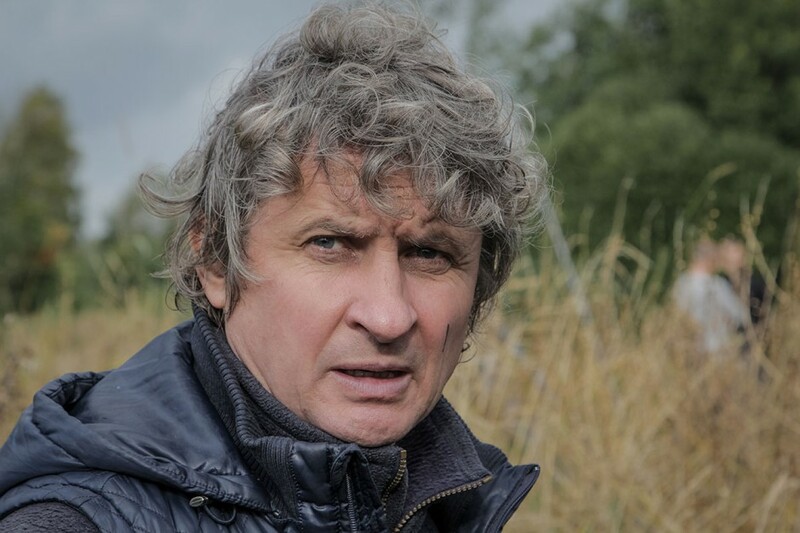 Evgeny Tkachuk finished his shootings in the series and says goodbye to film director Konstantin Khudyakov. Dmitry Tarasenko let his crew see, how to give a blow. Tarasenko used to be a teacher in botanics, but now he is one of the most well-known stunt coordinators, Taurus World Stunt Awards 2017 nominee, given for the best tricks in the movies. 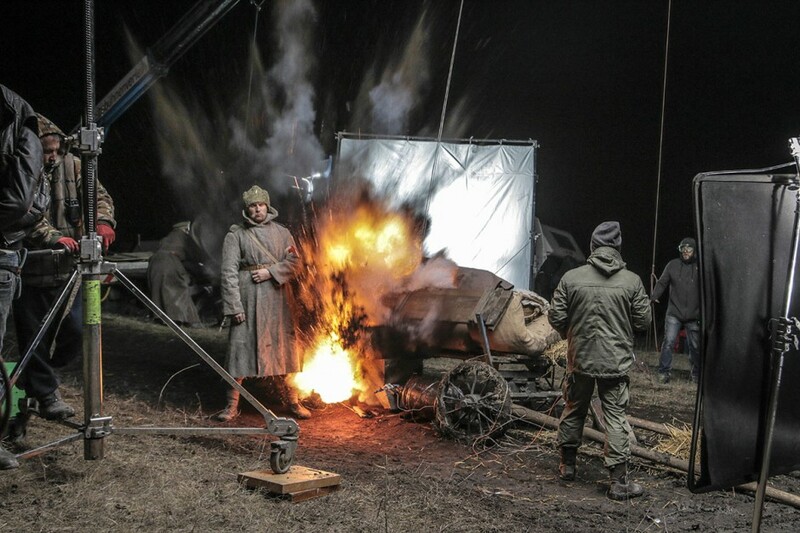 A big stunt crew was working on the set – more than 30 people headed by stunt coordinator Dmitry Tarasenko (in the photo – with a smoke flare). To make the fight scenes as safe for everybody as possible the stuntmen always take the blow. 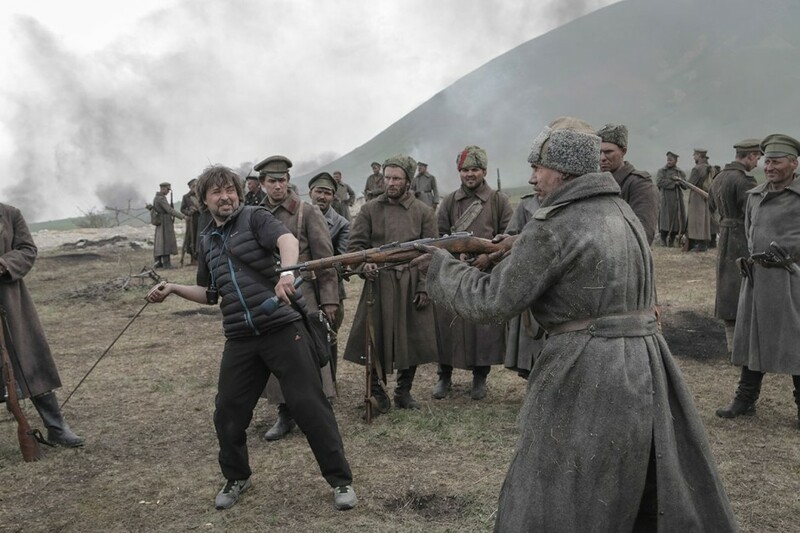 Here actor Evgeny Tkachuk can be seen fighting with the stuntman. Though the explosion looks quite convincing, the debris is soft – turf, husk and other fakes. 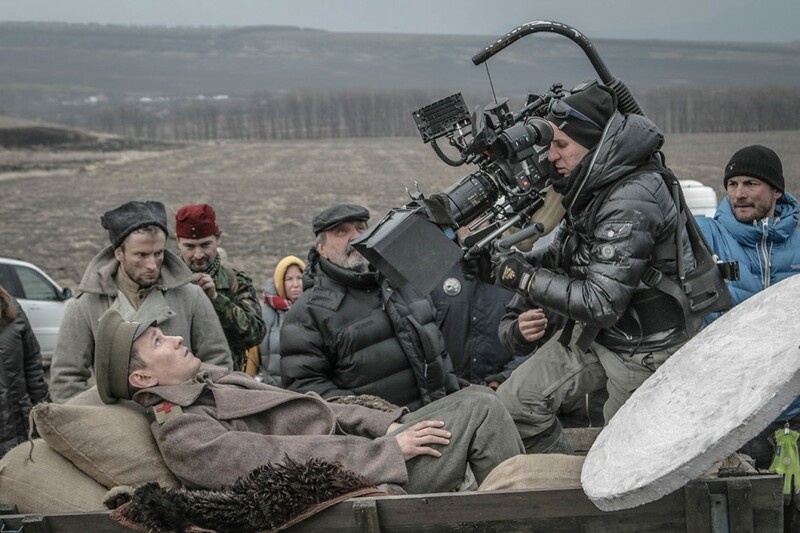 Actor Anton Shagin is lying in the medical train, cameraman Maxim Shinkarenko is filming the scene, and film director Konstantin Khudyakov can see right away on the camera screen, whether the scene looks convincing. 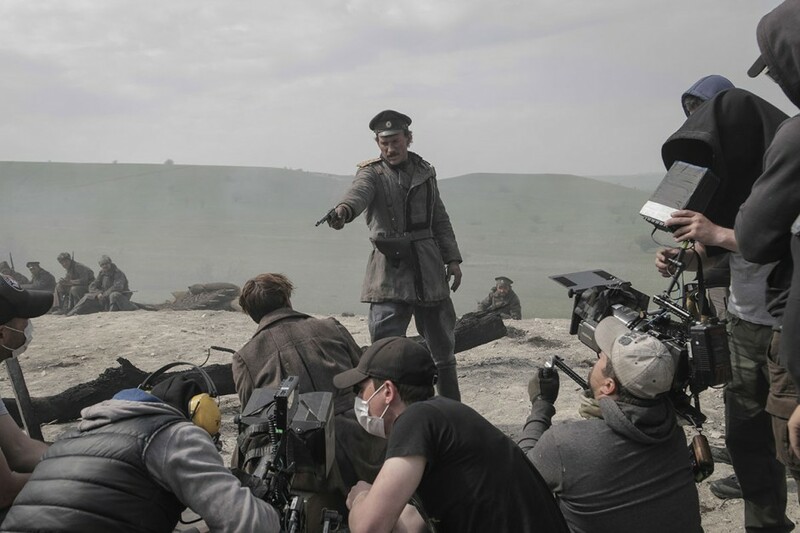 Filming of the bombardment of the medical train, supervised by the main pyrotechnician Vladimir Ponikarovsky (with his back turned in the photo). This trick was carefully prepared for a long time despite being only a couple of seconds long. 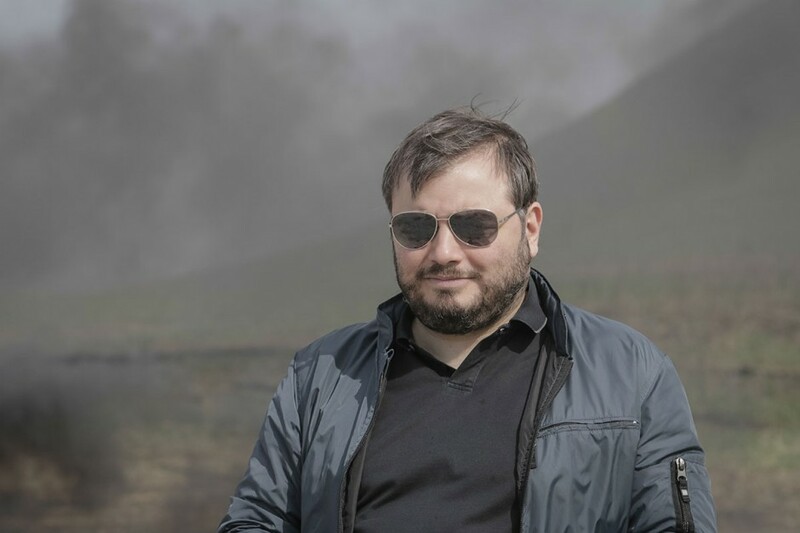 The stuntman gets to be dressed in special clothes, his face covered with soaked with special solution mask, he is set on fire and then the fire is extinguished. 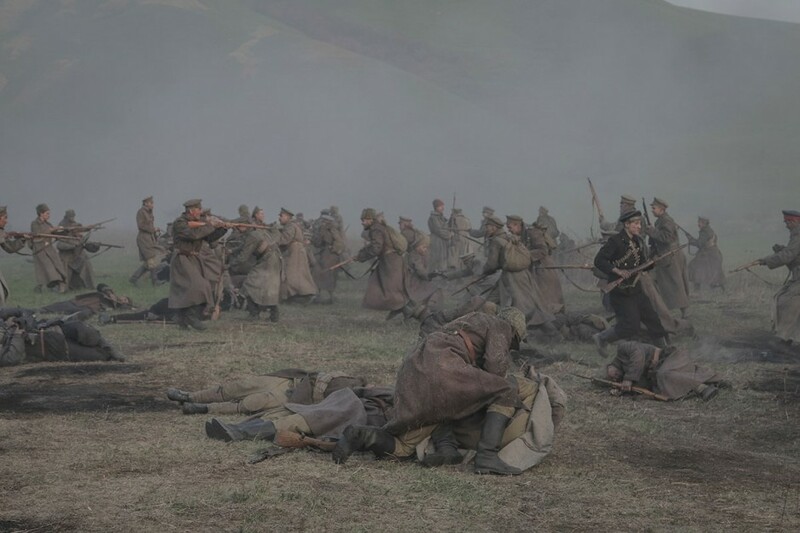 Around 30 corpse dummies were used during the filming – they were placed over the battlefield. 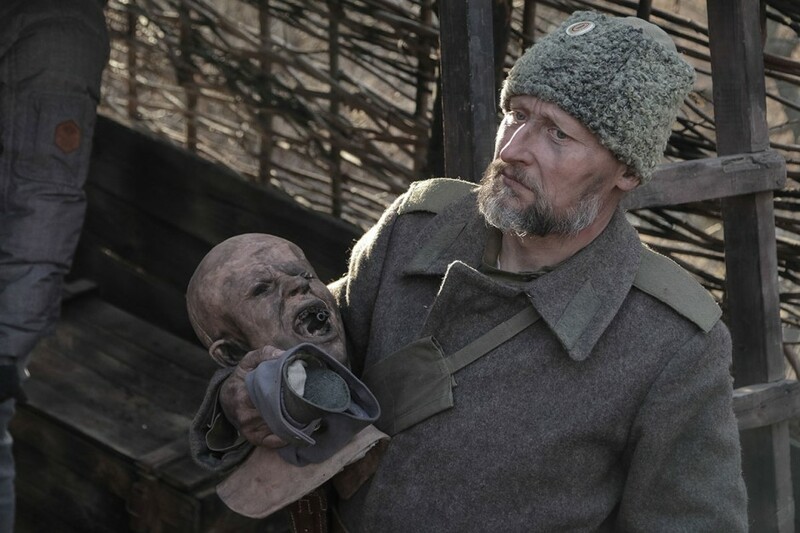 In the photo the stuntman holds the «torn away head». 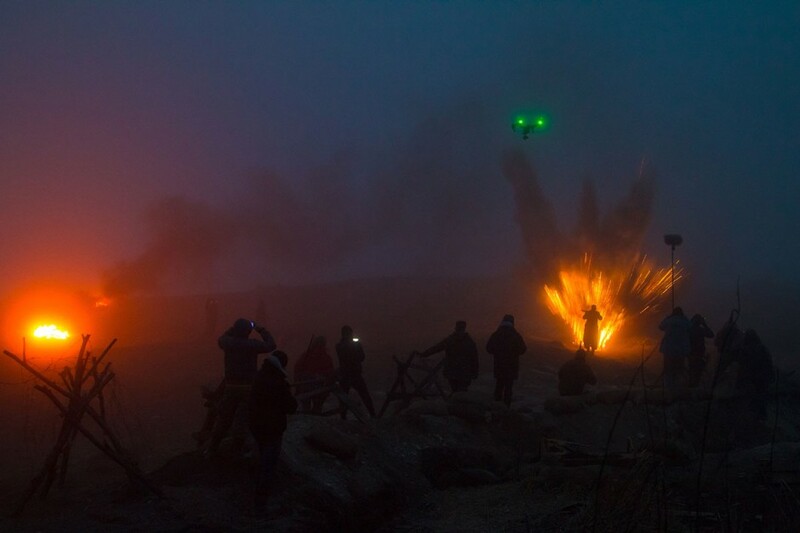 A quadcopter was used to film many scenes, for example to show the scale of the battle. Green lights on top of the photo are the copter. 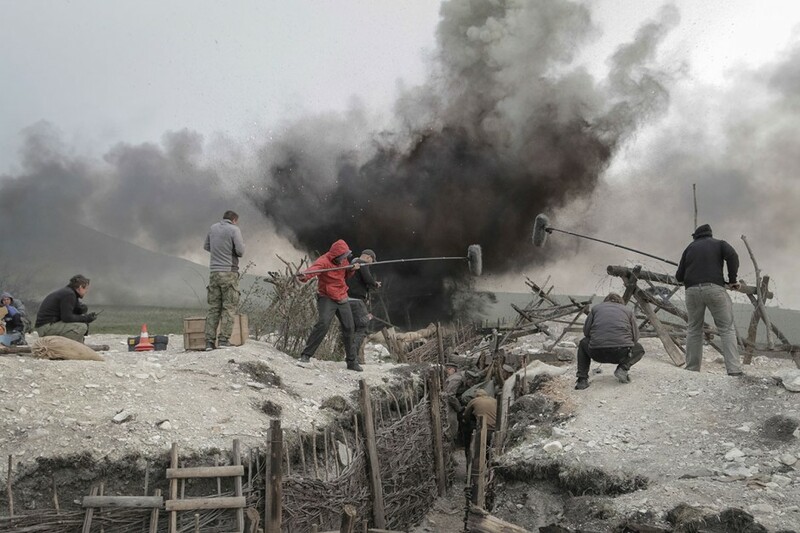 Around five pirotechnician were working while filming the battle to make sure that everything is burning, exploding and emitting fumes. Different kinds of smoke were used – both black and white. 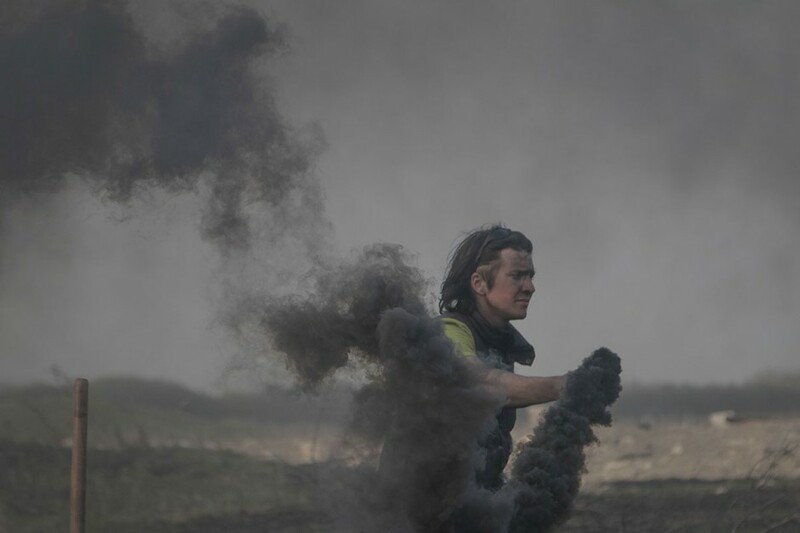 In the photo: pyrotechnician Alexey Ponikarovsky with a smoke flare. 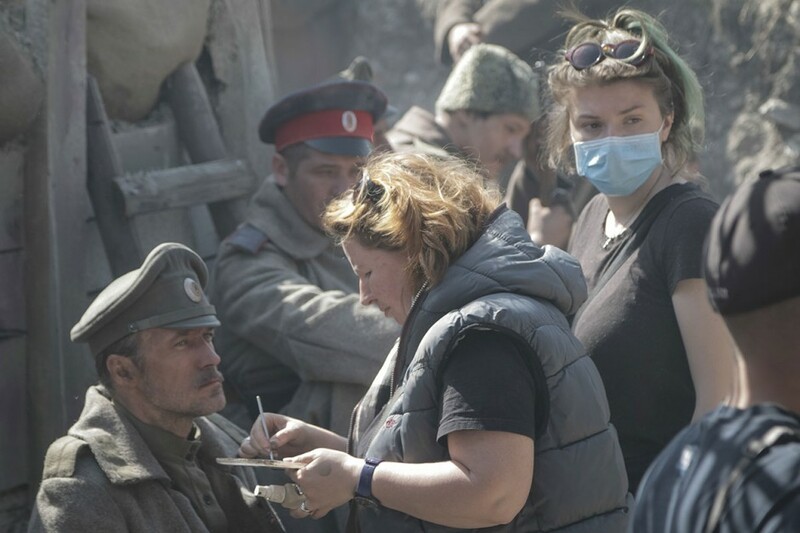 Makeup artists Galya and Dasha brush up the makeup of actor Pavel Trubiner. 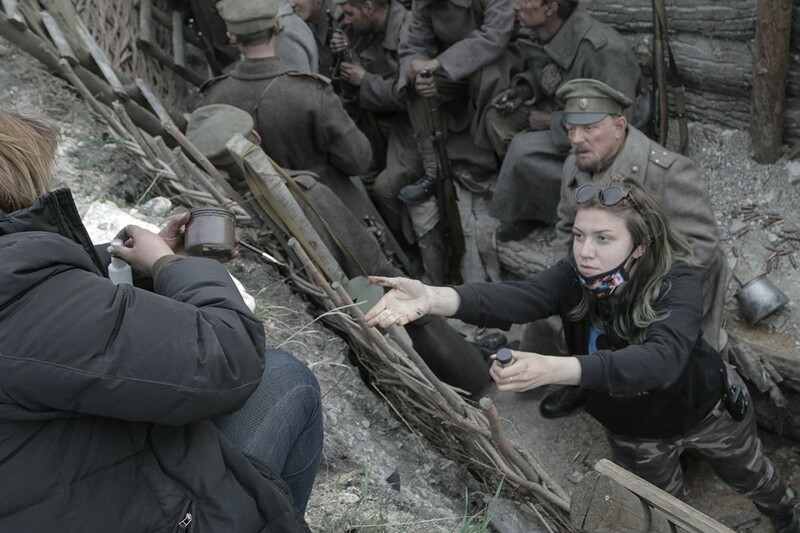 After every take makeup of all actors shall be checked even if it was the scene with 500 people on the battlefield. 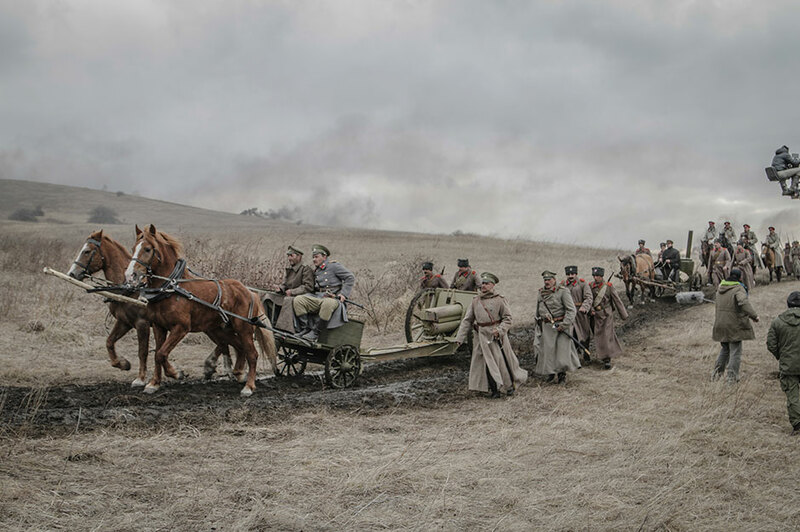 Battle scenes were filmed at the foot of the Dzhutsa mountain in Stavropol Krai on the field exceeding 10 hectare in size. 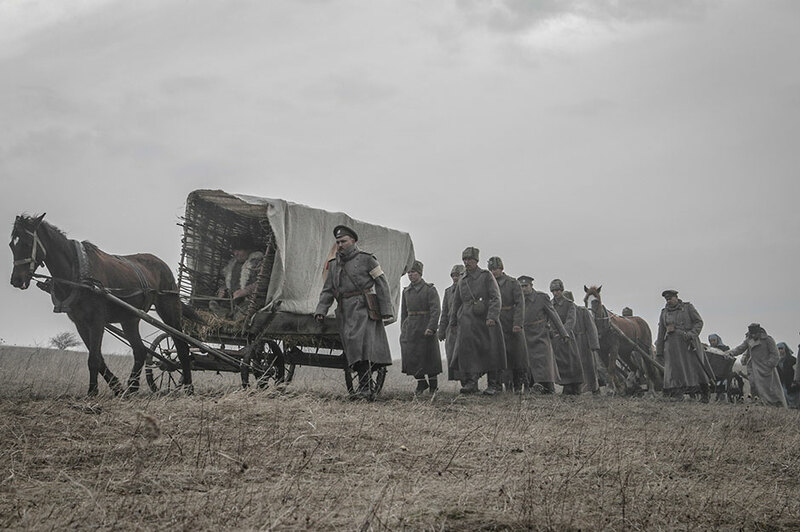 Art director Sergey Khudyakov had to find locations in Russia, where the events of 1917 would look most convincing. Saint Petersburg, Pyatigorsk and Petrozavodsk were chosen. The “capital of revolution” of past turned out to be the most difficult location to work in – air-conditioner units, billboards and other novelties of our time were always getting in way. 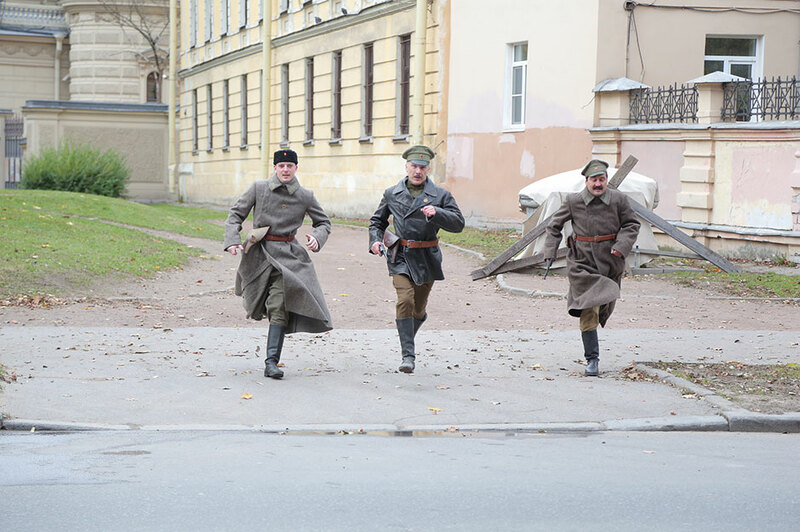 The last shooting took place in Pavlovsk. 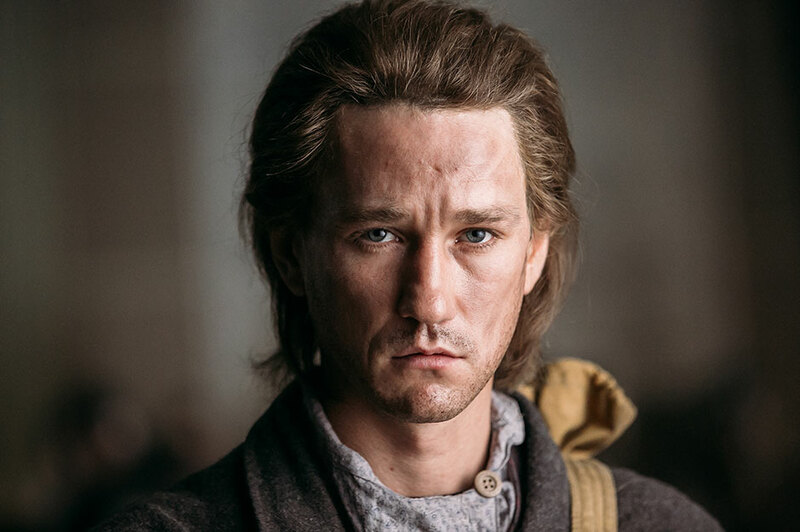 Film director Konstantin Khudyakov discusses the scenes not only with the main heroes, but also with actors playing secondary roles. 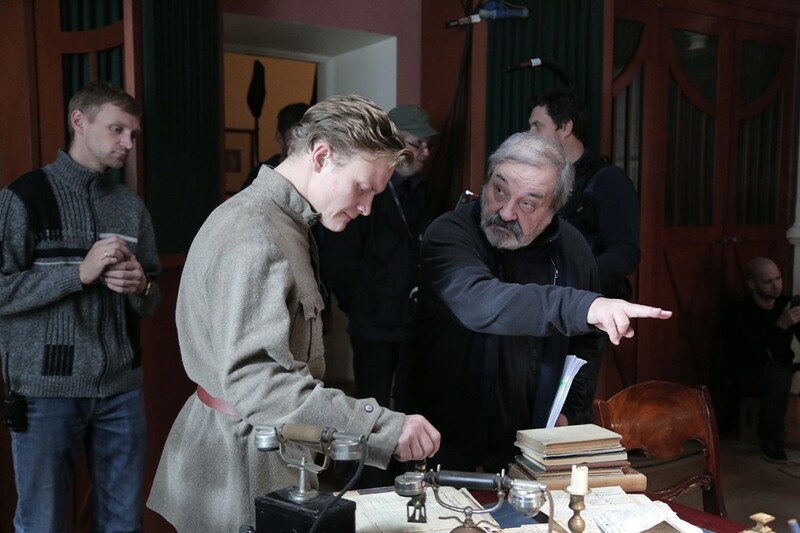 Film director Konstantin Khudyakov rehearses an episode with the actor. 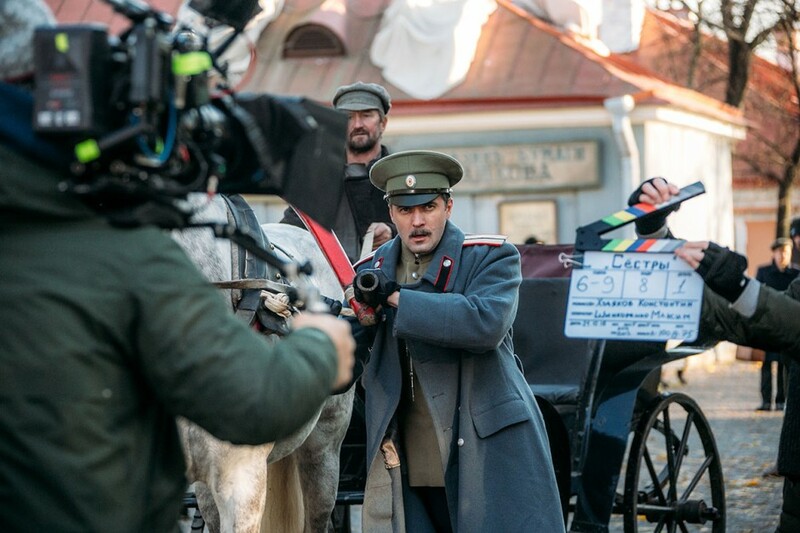 Actor Pavel Trubiner, cameraman and a stunt horse while filming the episode of the wedding in the Peter and Paul Fortress. 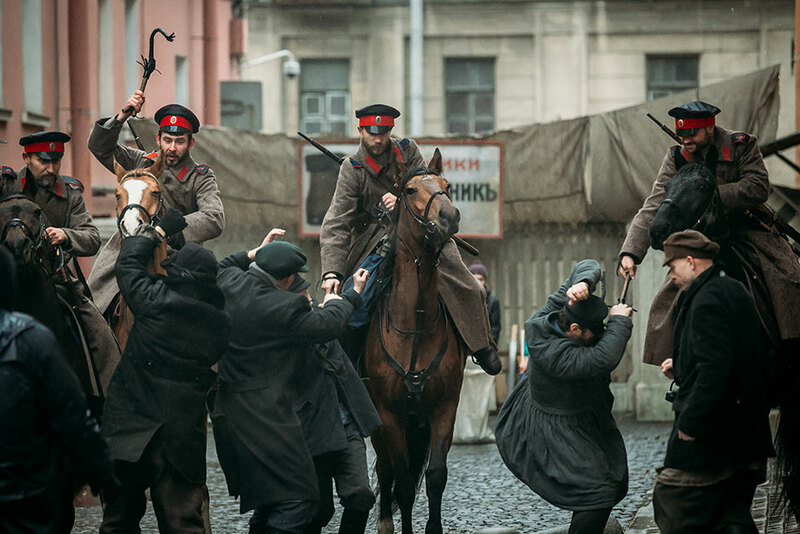 Since there were always shots, noise and difficult tricks being performed on the set, only specially trained horses that don’t get frightened by shots could be filmed. In the book, Dasha Bulavina was robbed by the “bouncers”. These criminals were active in Saint Petersburg in 1918-1920 and used to attack mainly women and older men frightened by “ghosts”. They got their name because they moved with jumps using springs or stilts. Here stuntmen filmed as “bouncers”. 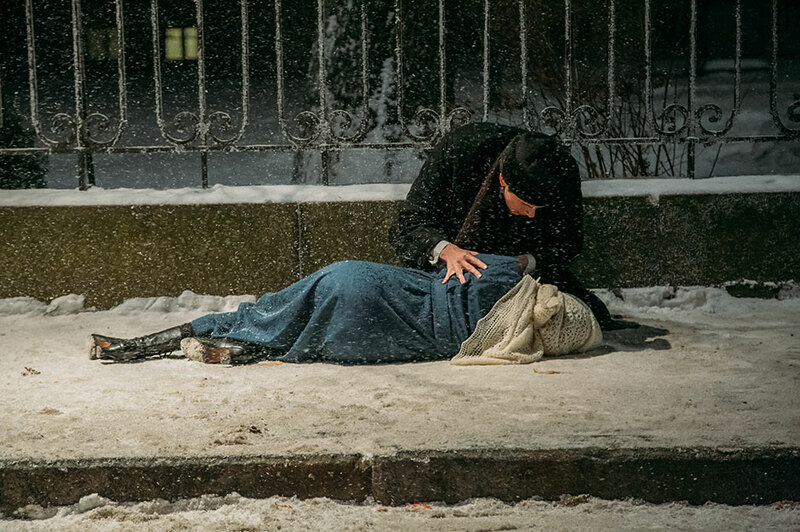 The robbery of Dasha Bulavina was filmed outside The Lesgaft National State University of Physical Education, Sport and Health – the fence, walls of the houses and the street proved to be very cinematic. 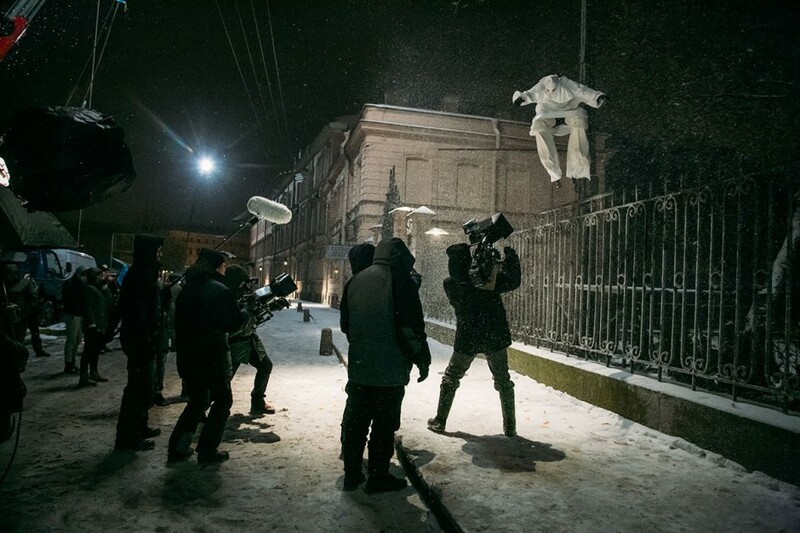 It was snowing on the day of shooting, but the real snow was added with the artificial. 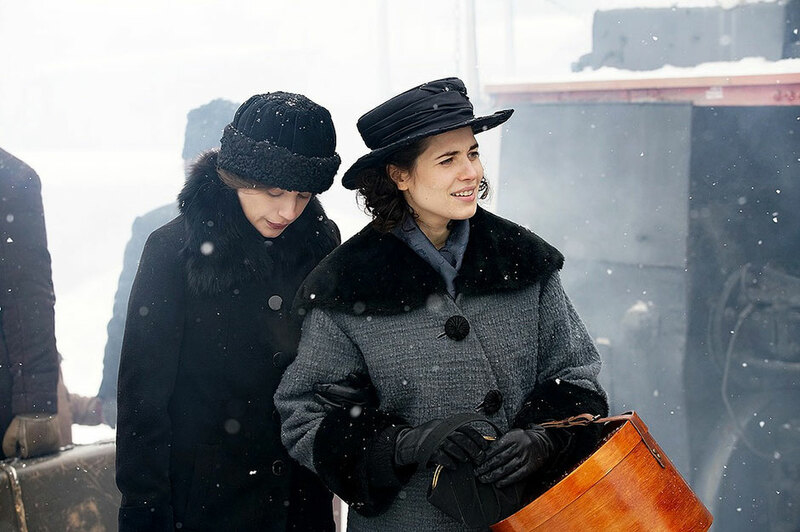 Nearly all the shooting took place during the cold season (winter and early spring), thus the film crew had to spend the whole days out in the cold or in the rain. 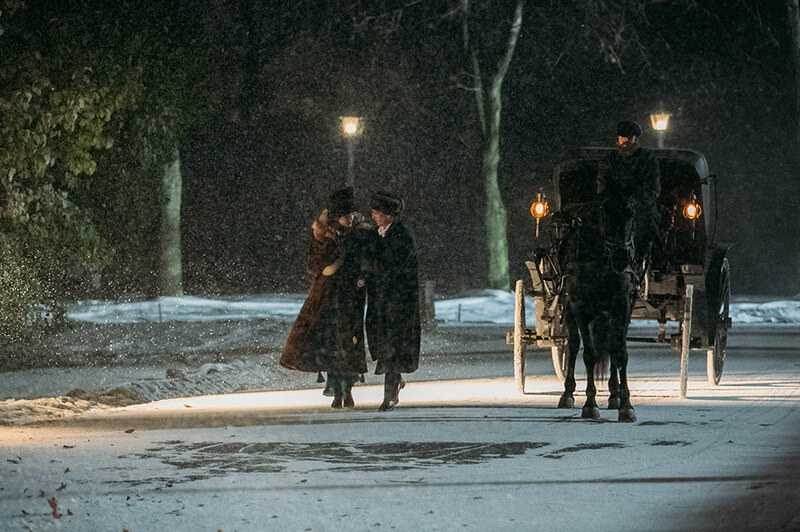 This episode was filmed in the cold for half the night.